My main inspiration for this project was a Malm fireplace taking up a large corner of my living room and my desire to make it a little more attractive. The fireplace has come in very handy during spells of no electricity in the winter, so I knew that I didn't want to remove it — just hide it. Another inspiration was my husband's grandmother who was a wonderful, spunky, German woman able to put a smile on anyone's face. She passed away last fall, and I wanted to do something in her memory. The final inspiration was our fifteenth wedding anniversary, and glass is the traditional anniversary gift for fifteen years. Knowing that I would probably never buy a large sheet for myself, my husband gave me a large sheet of Bullseye fracture-streamers glass. The initial challenge was how to design a screen that I would enjoy having in my house. After trial and error, I was able to copy the best features from all of my design attempts to end up with this design. The process was greatly simplified by the Copy and Paste features in Glass Eye 2000. 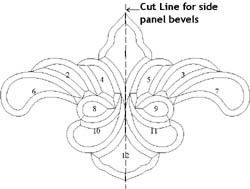 The starting point of the design was the large bevel cluster. The corner and side bevels were put in to tie the bevel theme in the overall design. I used the Browse Bevels feature in Glass Eye 2000 to choose the bevel clusters. 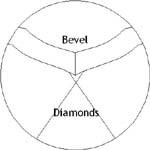 The size of the main bevel cluster was important. I wanted a bevel that would take up a large portion of the main panel in the fireplace screen. It also had to be large enough that it could be split between the side panels of the screen without distorting it beyond recognition. A Mika International MB-18 bevel cluster fit the bill at 21" wide. For the corner bevel clusters, I used Mika International MBC-3 clusters which, when purchased, come as a pair. Glass Eye 2000. made the process of selecting the glass very simple by being able to choose the actual glass for the design. The color scheme of the design evolved from the fracture-streamers glass. In order to combine the colors that were in the fracture-streamers glass and stay with the Victorian antique look of my living room, I decided that a geometric panel seemed more appropriate than a scenic one. The bevels were used to keep the screen light in color (that corner of my living room is rather dark) and add to the Victorian look. I was switching the colors around in Glass Eye 2000 right up until I started cutting the glass. During construction I discovered some problem areas in the design that needed to be revised. The first area that needed modification was at the base of the large bevel cluster. Several lines of lead came converged forming a lead came blob. By removing the partial diamond, I resolved this issue. The next area that needed improvement was the bevel cluster. I did not allow enough space for the lead came between the pieces of the bevel cluster. Needless to say, the large cluster grew and the mauve glass above it needed to be cut down. The most unnerving part of the construction process was using a glass saw to cut the two pieces of the second large, expensive bevel cluster in half for the side panels. Knowing the cost to replace the cluster if I messed up either cut, my fingers trembled while making the cut. After successfully making those cuts, I used the glass saw to cut the four 1½" x 8" bevels that connect at the outer edges of the main bevels. 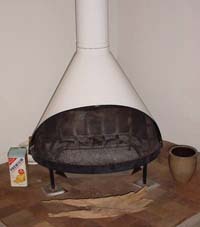 Overall, the construction of the fireplace screen went very smoothly, and I credit Glass Eye 2000 for that. If a design problem came up, I went into Glass Eye 2000, came up with a solution, and then just reprinted that area. Some of the changes that I made to improve the design during construction were possible with hand drawn designs, but it was faster to use Glass Eye 2000 and the Undo button. Leading the project went quickly. I used round 3/16" H lead for the area between the fracture-streamer diamonds and round ¼" H lead for the rest of the project. Flat ½" H lead was used to frame the large panel and flat 3/8" H lead for the side panels. Finally, to hold the panels in the wrought iron screen frame, I used black silicone caulk that I found at the local home improvement center. 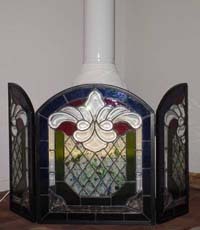 I have read that some people leave their stained glass screen in front of a burning fireplace. Due to the extreme temperatures, that is not recommended. I have set a fluorescent light stick on the andiron, which is easily removed when I want to use the fireplace Because I have used bevels and don't want the dark fireplace opening to show through the bevels, I have a piece of sheer white material clothes-pinned over the opening. The material diffuses the fluorescent light very nicely. Fireplace screens can pose a serious hazard to children and animals. Lead and glass are the most obvious dangers, but the weight itself can also cause problems. 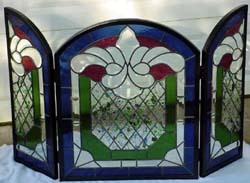 Once lead and glass has been added to the wrought iron frame, the screen gets quite heavy. My completed screen weighs over 40 lbs. Does the fireplace screen look familiar? On a whim (and ncouragement from my husband) I entered Delphi's Photo Contest. Imagine the surprise when I received my new Delphi catalog in September, and there I was on the cover! Kirsten lives in the hills of east Tennessee with her husband and two children. She took her first stained glass class in 1996 and was absolutely hooked from the start. She has since taken as many classes as offered at her local shop. Her next adventure will be a class on fusing. Stained glass has just been a hobby for her until recently. She has started doing several commissioned projects for friends and neighbors and has several more in the works. If things continue at the current pace, she says, she will have to start a business and hire some cheap labor (her husband): "I build 'em and he installs 'em!"